Being able to have and enjoy a vanity table and chair is a luxury that not everyone gets, because our bedrooms just aren’t big enough to fit them! So, if you’re one of the lucky few who have that special nook or cranny to use one of these beautiful pieces every morning and evening while you’re getting ready for your work days or date nights, we’ve got some inspiration for you today. 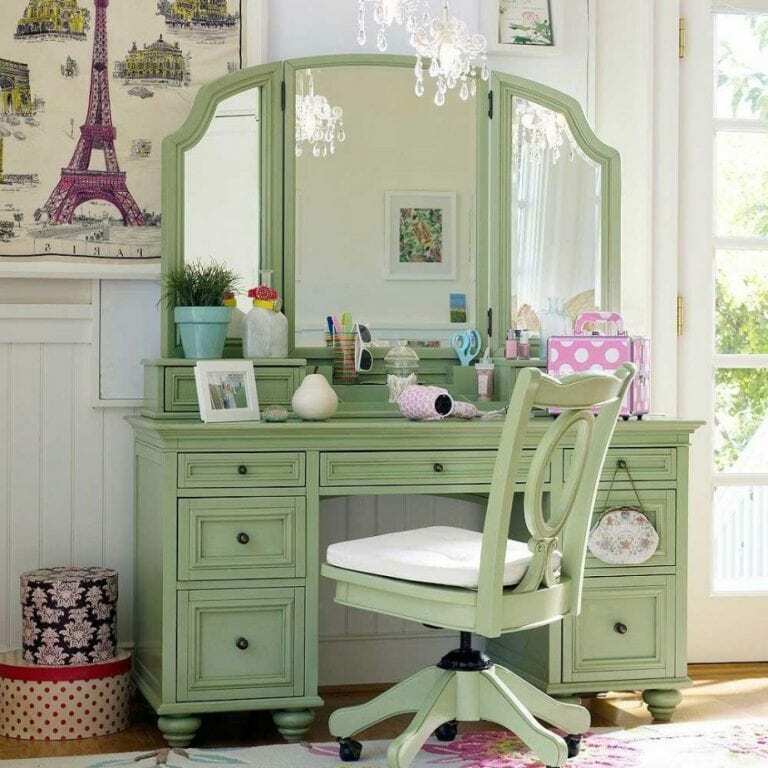 Check out these 12 amazing bedroom vanity table and chair ideas! A vintage flavor and traditional style, this design set features a neutral duo tone and a very sophisticated essence. You’ll have some space to keep your necessities, space to style the tabletop as you see fit and a personal space to enjoy everyday. And pay attention to the beautiful details of this piece with its custom-designed crystal hardware and heirloom look. This selection has a delicate fashion but also versatility, functionality and options. Instead of the shelving for organizing and displaying, you can opt for a mirror and switch out the pieces as you see fit! This pick is a great choice for a young teen or even a college student with her own apartment. A set without the “normal” Victorian appeal, this modern piece is perfect for smaller spaces with a contemporary vision. It’s classy, elegant and clean but still very serene and functional to help get ready for your day. The mix of silver and traditional neutrals also make for an interesting and easy piece to blend. Bedroom interior in the style of Traditional. Rich wood decor and classic furniture. This set may be my personal favorite of the bunch because of it’s luxurious first glance and elongated length. We love the stool and table combination and how it “just” matches in a quirky, yet still traditional, way. We also are swooning over the 3-part mirror which can make getting ready in the mornings that much easier. If you’re a fan of a more traditional route that will fit in your home and not make too much of a scene, try going with a beautiful and well-made wood piece that will be functional and last for years. This set has a lot of great storage and organizational space but can still be easily dolled up with some perfume bottles and lamp of your choice. The rose accents on this set make it so much more whimsy and romantic, don’t you think? This piece too has a tri-fold mirror, that every woman deems as quite the helpful accent. And we love the textured stool top in a satiny finish. Of course, the extra large drawers help to conquer clutter as well. Another beautiful piece that we’ve been gushing over, this pistachio-colored vanity set is a showstopper and will certainly set the scene for your bedroom. It’s got a quirky, eclectic vibe but could also easily fit into a super girly and Victorian-inspired space as well. The wheeled chair will help you to get around in the morning a little bit easier too! 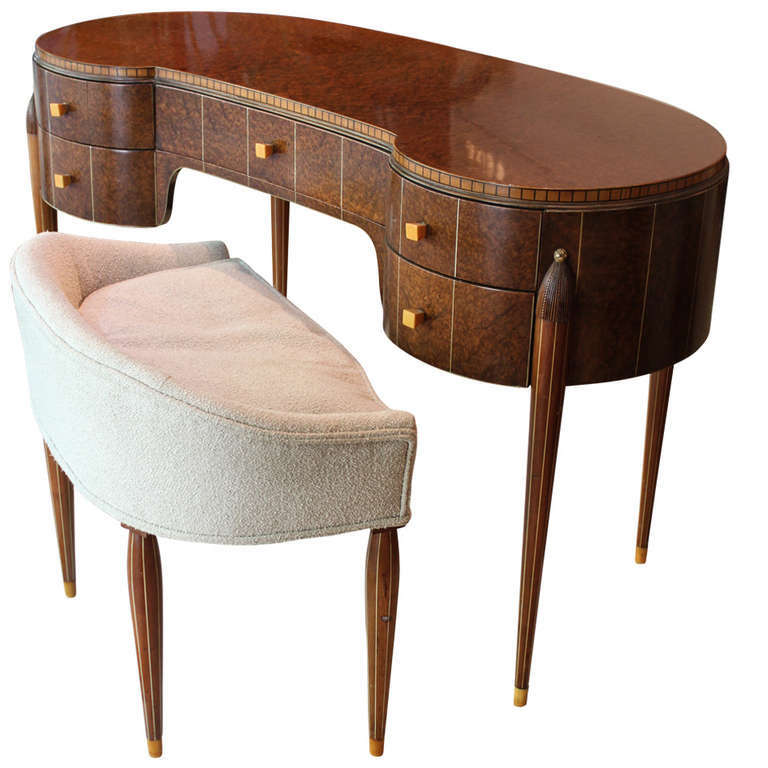 Early American make-up table complete with matching stool by Widdicomb Furniture Company established in 1863 by George Widdicomb. Just like the captain states, this vanity table is that of early American style. With a “real” vintage and antique essence you can fit this easy beauty into a variety of spaces for an outside-the-box addition that will help transform a dull space into something a lot more cultured and interesting to look at and use. Inspired by the fusion of British traditional and old world tropical design, the Bermuda by Home Styles highlights Mahogany Solids and engineered wood with Mahogany and Albazia Veneers. Another beautiful, well-made and traditional style, this piece was inspired by the fusion of British and old world tropical designs. Called the Bermuda vanity, it is engineered with wood Mahogany and Albazia Veneers. Its rich chocolate color is also bold enough to make a statement without being too harsh a tone to fit into a cozy home. Diamond is a collection expressing a great desire to stand out, a bedroom where design attracts with its daring elegance, tinged with glamor. We are loving this “Diamond” set with it’s bold and fashion-forward style. It has chic, suave and modern elegance with a bit of sparkling glamor thrown right inside. The mix of textures create easy interest and the shine creates an illusion of more space, which is always a plus for your bedroom. 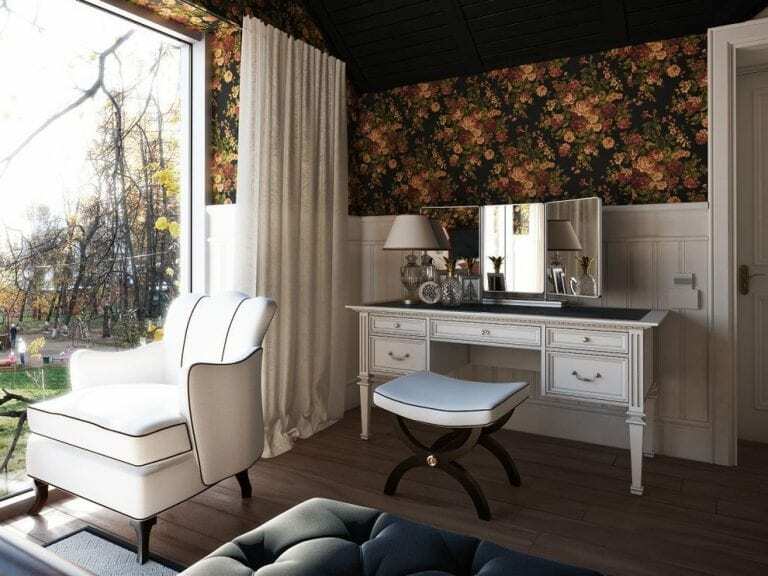 If you’re a fan of classic interior design styles but love the feel of black and its modern ethos, try finding a vanity set similar to this one. It’s got traditional values but the black and white contrast make for a much more fashion-forward look and feel. You can even add a pop of color to the tabletop for an easy personal touch. Go all the way with this modern and contemporary set. It has everything those with a futuristic, here-and-now vision would want. Contrasting, stark colors, sharp edges and clean lines. It’s not plush but it certainly makes a beautiful scene in any corner you can place it in. Although it doesn’t have as much space for organizing, it does have space for displaying and using. As you can see there are many options available. 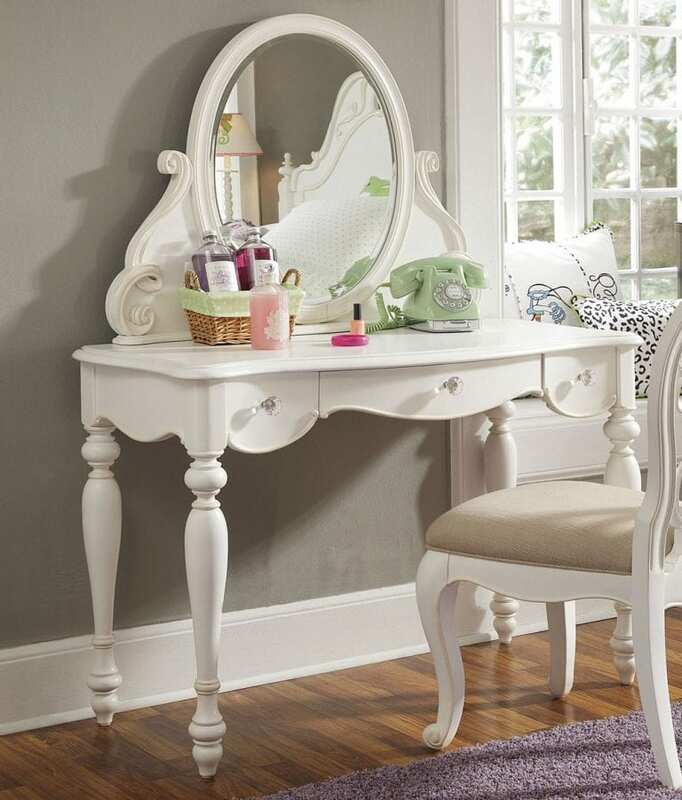 These 12 bedroom vanity table and chair ideas show the wide variety of products that are available in the market. Whether it be the finish, size or ability to fold up, the right idea is out there to fit your living space.